“As with most things in Indonesia, where there is yin there must be yang”, notes Richard Lofthouse and Captain Jimmy Blee of Asia Pacific Superyachts Indonesia. “On one hand, the beauty and adventures that cruising Indonesia presents are unparalleled in their diversity and escapism, a window into a different world. On the other, these positives are punctuated by the challenges of no real marinas or facilities for visiting Superyachts. The harmonious balance between the yin of the old world and the yang of the new has not yet been struck. In reviewing key country entrance ports scant focus is shown on Superyacht facilities, yet there are considerable options for vessels, as explained by Richard and Captain Jimmy in the anchorages following, starting with Bali and Benoa. Bali / Benoa: This major location has 4 recognized facilities for Superyacht alongside. The Bali Marina has room for boats up to 30 meters. This is a small yacht marina which can hold up to two 35m boats at one time and can provide water; with WiFi in the restaurant (not on dock). The marina does not provide shore power or fuel but does provide security. The Anchor / Stern to facility (3 spaces only) is at the port authority controlled location on a commercial jetty. Outside of Bali there are many outstanding anchorages where APS has based clients. The Gilies in NW Lombok provide one such spot - a beautiful bay with a jetty, where the stunning Oberoi Hotel can provide access (with prior permission secured by APS) and guests can be helicoptered in and landed there to join their boat. Among these anchorages is Moyo, home of the Amanwana Resort, situated on a beautiful bay where APS can land guests in a floatplane right next to their boat. And there is Kima Bay Manado, on the doorstep to Bunaken Park, where the team can access a jetty and provide ground support, which is just a short drive to the airport to pick up guests. The Benoa Marina is currently under development for limited Superyacht use. The Marina anticipates accepting vessels early 2014. This is a big commercial harbor now only suitable for ships 40m upwards. Security and fence are provided by agents as well as 6 ton water tanks and garbage disposal. No shore power but dampened gensets can be supplied for longer term clients. Bitung / Manado Nth Sulawasi: Comfortable anchorage or alongside commercial port jetty. Ambon: The gateway to Banda and central eastern cruise zone. Comfortable anchorage, some dock space in the short term. or alongside commercial port jetty. Sorong: The gateway to Papua and Raja Ampat. Comfortable anchorage. Biak: The gateway port of call for vessels coming from North Pacific. Comfortable anchorage. Batam: (Sumatra) Noongsa Point Marina. For vessels up to 25 mts with draft restrictions on low tides. Jakarta: (Java) Batavia Marina. For vessels up to 25 mts with high tide access and movement only. Jakarta Batavia Marina is another smaller boat marina located in the commercial port of Sunda Kelapa. The marina itself is well built and has water and shore power as well as an impressive Clubhouse. The major issue is that due to lack of depth and width in the channel, any ship over 35m and 2m draft will struggle to get in safely. Additionally, the greater cruising grounds lay a long way east of here and Richard notes clearances can be tricky. Surabaya: (Java) Uncomfortable dirty anchorage primarily useful for emergency stops. Kupang: (Far East entry point) Comfortable anchorage but less preferred point of entry. The Asia Pacific Superyachts Indonesia agency is primarily a logistical support that specializes in dealing with remote areas and getting fuel, provisions, transport and anything else that clients need going in difficult spots. A great example of this is when the APS team constructed a helicopter landing site in the jungle with logs, enabling their clients to access a tribe few have ever seen, an extraordinary experience for the clients (see photo). In meeting the many challenges, Richard explains, “We have a huge extended team throughout the hot spots of Indonesia. From cargo guys in many of the 600 airports to drivers in over a dozen islands… we have it covered! The agents also explain that Visa On Arrival for 30 days, renewable for 30 more, is relatively easy for most nationalities.. Social visas can be obtained elsewhere at Indonesian consulates pre arrival and sponsored by APS and can be renewed for up to 6 months. 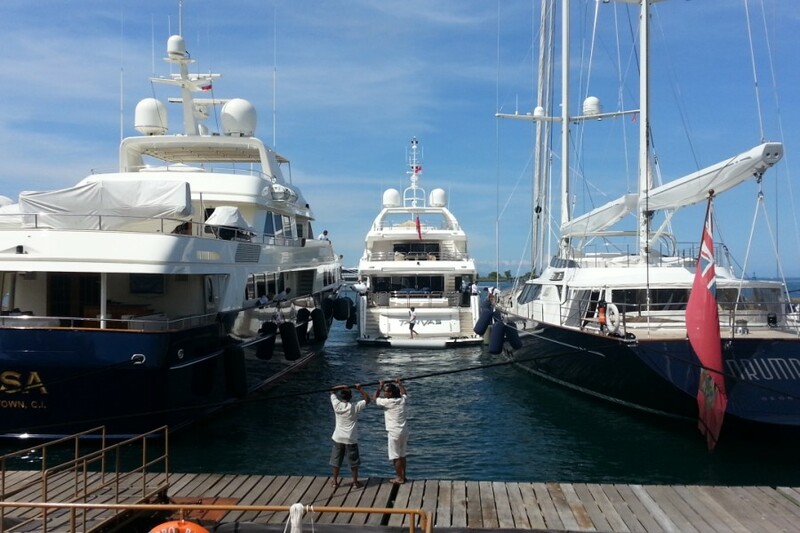 The APS Indonesia agents are happy to help in the planning and logistics of visiting Superyachts.